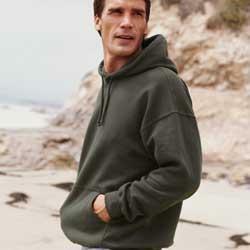 Gildan 7.75 oz 50/50 Blend Hooded Sweatshirt. 50% cotton, 50% polyester; 7.75 oz. 1x1 athletic rib collar and cuffs with Lycra double-lined hood with drawstring; muff pocket; double-needle stitching throughout. Air Jet Spun Yarn creates a softer feel without pilling.